Some people choose to sell their homes without a realtor for many reasons. The reality is that selling a house with a realtor may be a challenging task. What is great about selling a house without a real estate agent is that you don’t need to pay realtor’s fee. So, if you sell your house without paying real estate agent’s commission then you’ll be able to get the highest possible fee for your house. Plus, it’s incredibly important for you to deal with a good realtor who can sell your house fast. Sometimes finding a good realtor is very hard. However, if you choose to cooperate with a bad realtor it will take you too much time to sell your house. Also, selling a home with realtor can be too stressful. 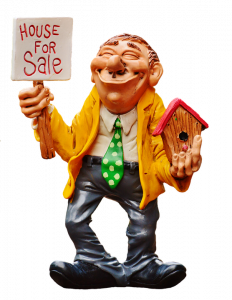 So, the big question is – how to sell a house without a real estate agent? Bellow, we’ll tell you about the ways to sell your house without a realtor. First and foremost, you need to get ready for selling your home. Do the research and price your house in the best possible way. If you deal with a realtor then he/she will probably evaluate your home and help you determine the asking price. However, if you sell your house without a realtor’s help then, of course, you’ll need to do this work on your own. Obviously, your home’s asking price doesn’t have to be too low. If you sell your home at low price then you’ll lose your money. On the other hand, home’s asking price doesn’t have to be very high. If you are trying to sell your home at too high price it may take you take a long time to find a buyer. There are three main factors that influence buyer’s decision: home’s location, home’s condition as well as home’s asking price. Analyze other homes available in your area. By doing this, you’ll be able to determine the right asking price for your property. In reality, some of your friends or friends of your friends may be interested in purchasing your house. That’s the reason why you should definitely inform your friends that you are planning to sell your home. This may help you find a buyer and sell your home without a real estate agent fast. However, the most important thing is that you’ll be able to get more money if you sell your house without a realtor. It’s widely known that the information spreads on social media very quickly. And of course, you need to take advantage of this fact if you would like to sell your house without a real estate agent. Use the power of social media to promote your house. In fact, the best way to tell your friends that you are planning to sell a property is to make an announcement on Facebook and other popular social media sites. Create a post on your Facebook page with great advertising text and images of your property. So, users will have an excellent opportunity to get familiar with your house. Plus, you need to figure out when your target audience is the most active on social media. Make experiments and track your results all the time. Then, advertise your property on Facebook and other social media at the right time. Sooner or later, you’ll be able to figure out how to get the most out of your social media marketing efforts. Obviously, you should act as a real estate agent if you would like to sell your property without a realtor. That’s why it makes a lot of sense for you to spend some time on studying realtor’s advertising strategies. This will definitely help you come up with great real estate marketing ideas and sell your house in the best possible. Let’s assume that you are trying to sell a house in a good condition. Or, maybe, you are selling a home in a hot real estate market? On way or another, you can consider investing some money in paid property advertisement. The advertisement is likely to provide you with high return on investment. Finally, you’ll be able to sell your house at much higher price. Sometimes people find it difficult to sell their properties even with an experienced real estate agent. For example, you are likely to find it hard to sell a house in a bad condition that needs to be repaired. If things go wrong and you begin to experience financial difficulties then it would be better for you to sell your house. By doing this, you’ll be able to avoid foreclosure and its negative consequences. However, it can be difficult for you to find a buyer for your house who agrees to take over your mortgage payments. Keep in mind that the help of a real estate investor is immeasurable in such situations. – It’s crucial for you to know that the vast majority of real estate investors are ready to buy a house in any condition. So, you don’t need to spend your time and money on house repairs if you choose to sell your property to a real estate investor. – It’s also important to note that most investors are ready to take over your mortgage payments. – Another big advantage is that real estate investors work fast and provide buyers with cash offers within 24 – 48 hours. That means that it will not take you too much time to sell your property to an investor. Obviously, if you contact a real estate investor for help then you’ll be able to sell your house fast and easy.